The APC223 is the commercial variant of the APC556 rifle used by elite military and law enforcement around the globe. Made in Switzerland using state of the art materials and manufacturing methods. 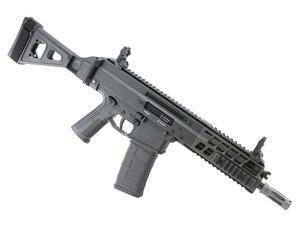 The APC223 operates off a short stroke piston system with AGR for suppressed use. Accepts readily available AR15 STANAG magazines. The 8.74" barrel and side folding SB Tactical brace offers a compact package for use in close quarters. Barrel Cold Hammer Forged 8.74"